Fresh & sensual yet deeply relaxing with essential oils of ylang ylang and orange. 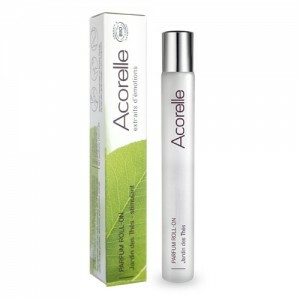 Absolut Tiare organic perfume roll on; a 100% natural fragrance with calming essential oils of ylang ylang and orange. An oriental perfume with base notes of vanilla. ALCOHOL**, PARFUM, CENTAUREA CYANUS WATER*, BENZYL ALCOHOL, BENZYL BENZOATE, BENZYL SALICYLATE, CITRAL, CITRONELLOL, EUGENOL, FARNESOL, GERANIOL, ISOEUGENOL, LIMONENE, LINALOOL. *ingredients from Organic Farming **Made using organic ingredients 100% of the total ingredients are of natural origin. 90% of the total ingredients are from organic farming.